When it comes to cheap hosting, no one can beat GoDaddy (warnings below!). Their $1 web hosting plan is the absolute lowest price for hosting in the market (except for Hostgator’s PENNY coupon for 1 month). Warning! It’s somewhat misleading though. While GoDaddy has the cheapest hosting, it doesn’t offer free SSL. And since HTTPS is a “must-have” for any website, you actually end up paying more with GoDaddy as opposed to other providers like SiteGround (see trap two). This is in complete contrast to the other end of the spectrum like Liquid Web, where you pay a high premium for top of the line support, hardware quality, and hosting add-ons. If you’re looking for the overall cheapest deal, I suggest DreamHost for web hosting, and InMotion for WordPress hosting. 1. $12 For 12 Months Hosting – But No More! The famous $1 web hosting plan is a special GoDaddy offer that’s not directly available on their website. If you click this link, it will take you to a page where you can sign up for a maximum of 12 months – for a grand total of just $12 dollars. Other hosting providers like Bluehost and Hostgator give deep discounts for the first billing cycle as well. But nothing less than 12 bucks for a year of hosting. The catch is that you can’t extend the plan for longer than a year. After one year, you have to renew your hosting plan at the regular price. You get a free domain with $1 hosting from GoDaddy. In case you want more than one, you can make a one-time purchase of a .COM domain for $0.99. This doesn’t include the $0.18 ICANN fee per year. This offer is restricted to just one domain per customer, and they will renew at the GoDaddy yearly domain cost. It’s probably best known for their domain services, so it’s not surprising that they can offer these low prices for domains. If you want to purchase more than one domain, you’ll have to buy it at the undiscounted price of $9.99 per year. 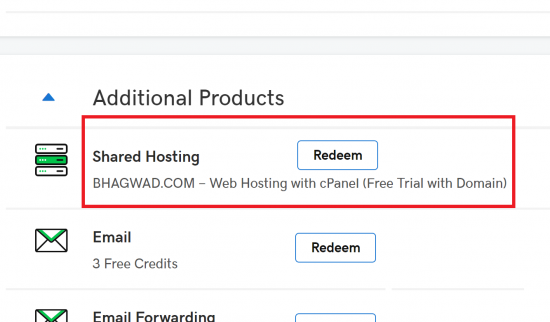 4. cPanel – What is cPanel? The $1/month plan includes cPanel hosting. cPanel is the control panel from which you administer your site. You can access your databases, create FTP accounts, view your visitors, switch your PHP versions, and a whole bunch of other functionalities that you would probably never use. It’s the single most famous control panel, and works only on Linux. The Windows equivalent is Plex. Select the cPanel admin interface and you’re good to go! The real killer is SSL. While $1 web hosting might seem incredibly cheap, it’s useless without an SSL certificate. Google already penalizes plain “HTTP” results in search, and Chrome now shows a warning whenever you visit a site without HTTPS. In today’s day, no one should have to pay for SSL. The big behemoths like Bluehost and Hostgator realize this. That’s why Bluehost recently introduced free SSL . Hostgator followed suit just one month later and now gives its users free Let’s Encrypt certificates as well. GoDaddy is left lagging behind as the only major web host that still makes users pay for the privilege of HTTPS. Charging for SSL changes the price comparisons entirely. See trap 2 on this page. GoDaddy offers monthly hosting only for a small subset of its plans. With regular shared Linux hosting, you can only get it for the Deluxe and above plans. Also, there’s no month to month hosting with a free domain. You need to purchase hosting for at least a year to avail of the free domain offer. If you really want a “no commitment” month to month hosting, my suggestion is that you choose DreamHost instead. Though you can’t apply the discount coupon for monthly hosting, you can still just purchase it on a monthly basis. It’s not very economical though! Why is GoDaddy So Cheap? It’s good to be wary of cheap stuff, especially when it relates to web hosting. And we’ve already established that the $1 web hosting plan is the cheapest on the market. So what’s the catch? Why is GoDaddy so cheap? The truth is, that it’s not! The only thing that’s cheap is the initial discount for $1 a month for a maximum of 12 months. After that, you’ll be renewing your plan at the regular GoDaddy economy hosting price, which is entirely comparable with all the other basic hosting packages of other providers. GoDaddy’s regular prices are pretty much the same after the discount billing cycle is over. So while it may look as if it’s cheaper than other hosting providers, that’s an illusion. The actual cost difference between all the providers is just a dollar or so per month! In case you’re worried about getting some special watered-down web hosting from GoDaddy, set your mind at ease. It’s nothing but the standard economy web hosting package. The only difference is that you can only sign up for 12-months @ $1/month. With the economy package however, you can carry forward your discount for a stunning 10 years! 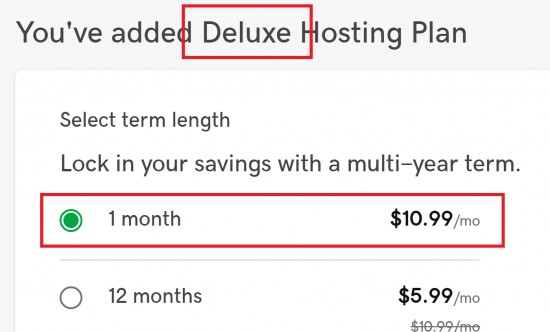 If you think about it, you’re not really saving money at all in the long term with the $1 hosting plan if you want to purchase for longer than a year. That’s because after 1 year, you’ll be paying the full cost of GoDaddy’s economy hosting which is currently $7.99. If on the other hand you purchase economy hosting at the regular discounted price (not $1/month), you can lock in your savings for many more years, and that will outlast the savings you get from the $1 web hosting plan in the first year. If you extend the billing cycle to just 2 years with the regular GoDaddy economy plan, you will save a lot more money than with $1 hosting for the first year, and the undiscounted price for the second year. 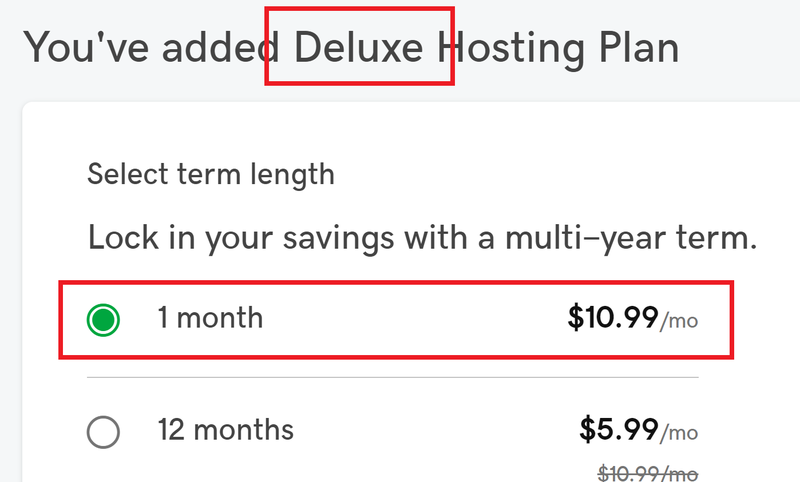 So the only scenario in which you save money with $1/month, is if you plan on hosting for just one year, and nothing else. Still think GoDaddy is cheap? So what do you do if you want the cheapest web hosting? My recommendation is DreamHost. While it’s true that their initial discounts are not as steep as GoDaddy, you save money in the long run. Plus, they also have free SSL in the form of Let’s Encrypt certificates! Here’s a complete list of DreamHost coupons along with a review of the service. What About Other GoDaddy Hosting Packages? This article only examines the scope and limitations of the $1 hosting deal. You can find the web hosting price of all their other plans by applying the appropriate GoDaddy hosting coupon to their other services. GoDaddy basically has two tiers of shared web hosting – regular, and business. They also have $1 WordPress hosting, which is the WordPress equivalent of the shared hosting plan. And of course, they have the normal hosting progression of VPS, and dedicated servers. GoDaddy’s 1-dollar hosting plan is their regular shared hosting at its lowest tier – also called “Economy Hosting”. With it, you get the usual features one would expect from such a plan – including 1 website. You also get the standard 1-click installation of a bunch of applications like WordPress, Joomla and Drupal, DDoS protection, and security. You also get 1GB of MySQL database space. A nice bonus is that GoDaddy has expanded its product offerings so much, that it can afford to litter its hosting packages with freebies that no other provider can give you. For example, you also get 1-year of free Outlook 365 e-mail. In addition, their global data centers allow you to transfer your website to any of their global data centers so you can choose the server closest to your potential customers. Finally, you also get a free domain! For me, this really puts the icing on the cake. Other hosts give you a free domain with signup as well like Bluehost and DreamHost, but not at this low monthly price! 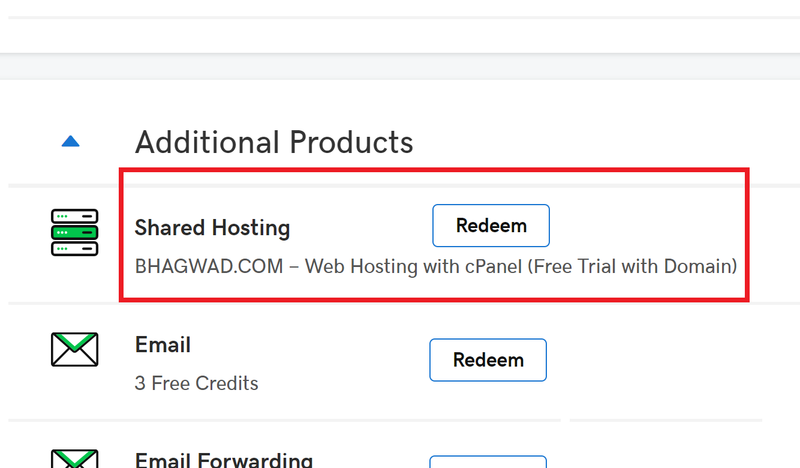 Does GoDaddy Offer Free Hosting? After this though, you’ll need to upgrade to the regular web hosting price. This is the only free hosting that GoDaddy offers. GoDaddy also offers e-mail services without the attached hosting plans. For just a few bucks a month, you can get an inbox with your business domain name, without actually purchasing web hosting. I’m not sure about who would use something like this since most businesses need a website anyway. And if you have web hosting elsewhere, that same location will give you e-mail service as well. But if there is a circumstance where you don’t want or can’t host your e-mail with your hosting provider, or you don’t have a web hosting service, then GoDaddy’s email hosting is for you! Is GoDaddy a Good Web Hosting Service? 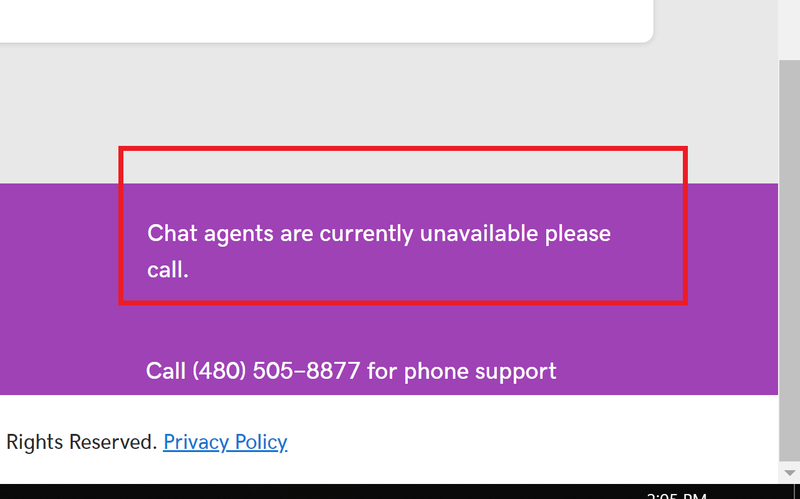 Chat agents are currently unavailable please call. 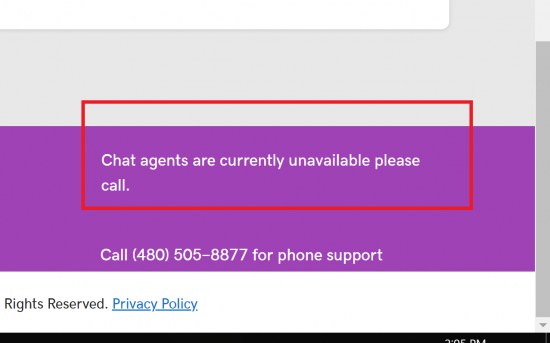 Surprising that phone support is 24×7, but chat support is not! Apart from this caveat, I don’t think you can go really wrong with GoDaddy. They’re a pretty good hosting service and their $1 web hosting plan is the cheapest on the market for that duration!